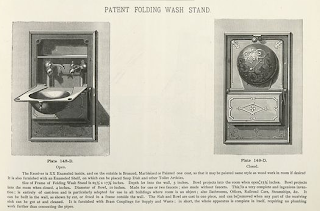 "This is a very complete and ingenious invention" notes the fine print describing the Folding Wash Basin produced by the J.L. Mott Iron Works. I would beg to differ from that on one small point: A drain line might make it even more complete. i agree a drain would add a lot. but there is something to be said for sinks with no drains: they force the user to use less.